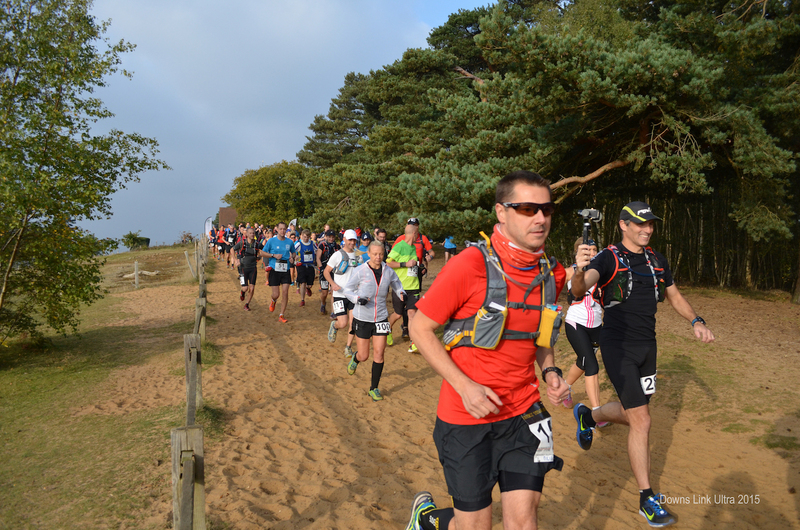 The Downs Link Ultra is a 38 mile race from the top of Martha’s Hill, near Guildford in Surrey, to Shoreham-by-Sea in West Sussex. Apart from the start it is pretty flat through the whole 61 kilometres. The Downs Link Ultra is so called because the route uses the footpaths and trails which link the North Downs and the South Downs. Cunningly, it’s called the Downs Link. 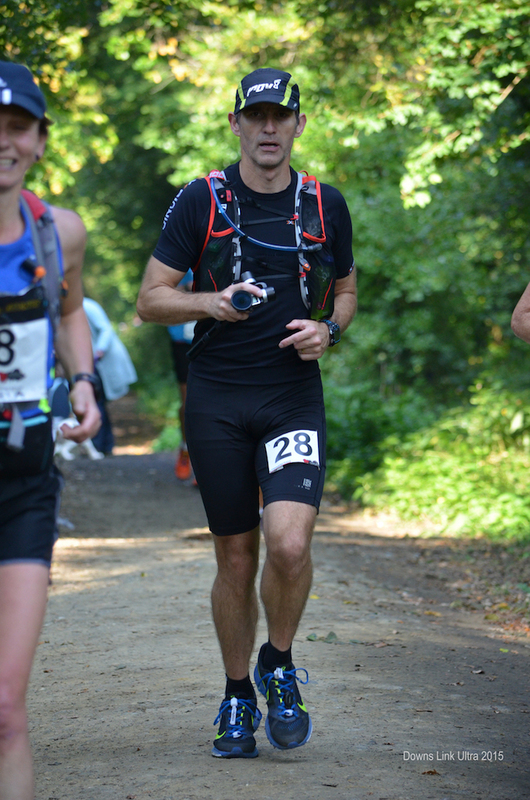 It’s organised by Sussex Trail Events who are also responsible for the Dark Star River Marathon which you can read about here. Race start at 9am meant leaving Worthing at 7am. I managed to grab a lift with Richard. He’s running very well at the moment. After trying and failing to keep up with him at the High Weald Challenge Ultra last week, my plan today was to run my own race! We arrived at a freezing cold race registration in the car park near the top of the hill. Once I’d got my number I started queuing for the portaloo but realised it was getting a bit late so made use of nature’s facilities instead. Richard and I seem to get recognised as regulars at race events more and more these days. This morning we met Zoe, Craig and James. The Downs Link Ultra was to be Zoe’s longest race distance ever and so I featured her at the start of the film. Following a race briefing and plenty of selfies in front of the beautiful view, the blast on the hooter sounded at ten past nine and we were off down the hill. This first section is tricky. It’s tempting to bound down the hill at top speed but if you’re about to run 38 miles you really don’t want to start off too fast! It’s also quite a technical descent so you do need to be a bit careful. The hill levels out after a kilometre or so and the rest of the route is flat, flat, flat. Pretty much. As suspected, Richard went off and in to the distance almost immediately. Actually, a few of us got stuck behind a horse for a few metres early on which allowed the front runners to disappear out of sight. In other races, occasionally I might catch Richard towards the end, but I wouldn’t see him again today until the end. My plan from the outset was to finish in 6 hours. This meant running just a little faster than 10k per hour or 6min/km. For the first 20k or so there was a small group of about 6 of us. Me, Mark Johnson, Andy Strach, Maria Pali, Sharona Harrington and the miles ticked by nicely with some banter. We were all feeling good and knocking out a kilometre every 5 mins 50 seconds. Perfect pace for a six hour finish. Early in the day the sun was beautifully dappled through the trees and spectacular behind big old railway bridges. We ran through a few deserted stations too. Although it’s not a stunning route it certainly has its pretty moments. Our little group began to fracture somewhere around 20k and by half way at 30k only Sharona and I were still keeping to our original pace. I have flirted with Coke in my hydration pack in recent races but I reverted to water this time. I drank Coke from the aid stations and ate a few Jaffa Cakes along with my usual baby food sachets. I was also taking two S-Caps every hour to replace sodium and potassium. 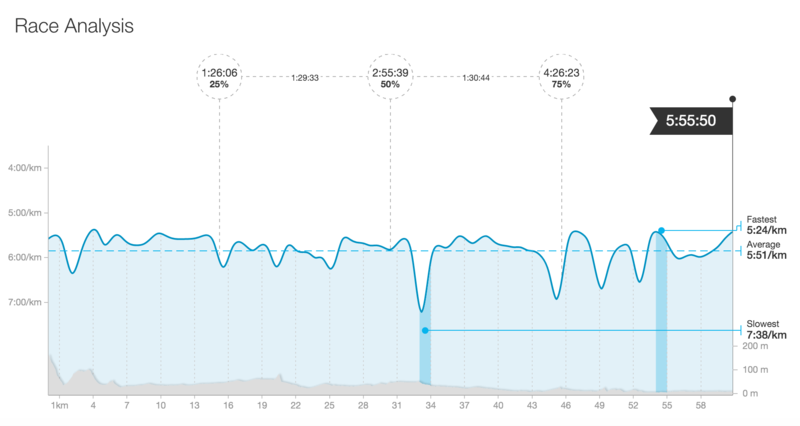 This nutrition plan seemed to serve me well for the whole run. However in my next race I will be trying Tailwind. I ordered it for the Downs Link Ultra but it didn’t arrive in time. Looking forward to seeing if it can sustain me without the need for anything else. I do find it a shame that I can’t really eat much when running as some of the aid stations, especially at Sussex Trail Events, have a lovely selection of foods. Melon, Mars bars, oranges, bananas, nuts, crisps, biscuits, sweets. Yum. In my last two races I gave got to the half way point and started to flag. I have had runners coming up behind, passing me and disappearing in to the distance. Not today. Today, I was the one passing the runners ahead. 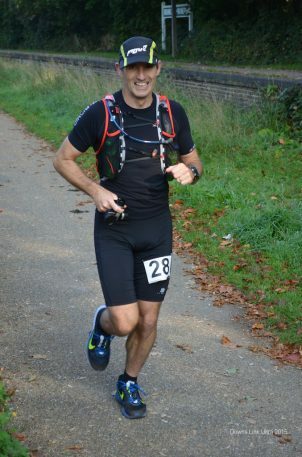 As the second half of the race unfolded I found myself keeping to pace quite easily and passing plenty of runners. I must have made up at least 10-15 places in the last 2 hours of running. I really was enjoying the flatness of the Downs Link Ultra. I ran all the way, only stopping at the aid stations, and didn’t hit anything resembling a wall. In the final few miles the route opens out from its tree lined railway track to reveal the River Adur. We crossed the bridge at Shoreham which featured so prominently in the mourning period following the crash at the Shoreham airshow and ran down to the finish at the Shoreham Activity Centre. I crossed the line in 5 hours 56 minutes. My wife and children were there to cheer me in as was Richard and his family. Richard finished in 5 hours 26 minutes in 7th place. 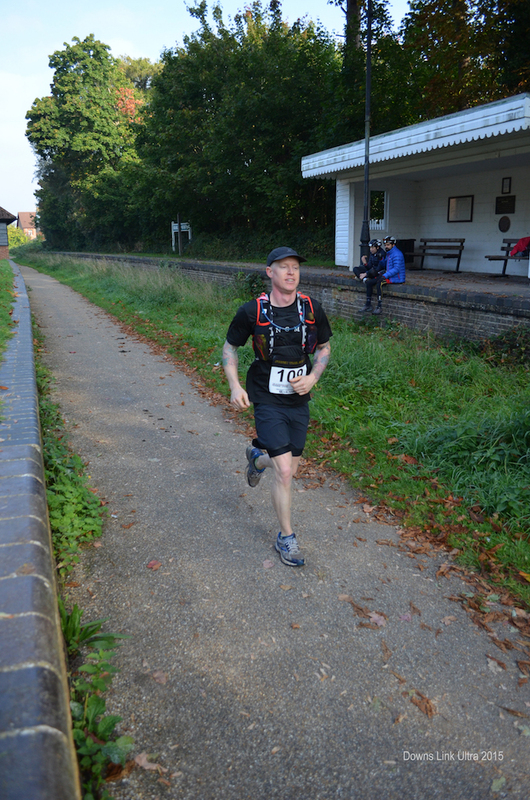 I crept in to the top 20 finishing 19th out of the 104 participants. I was very pleased with the run. I really like races in which I set out at one pace and finish at the same pace. As far as I’m concerned, that is the way to do it. 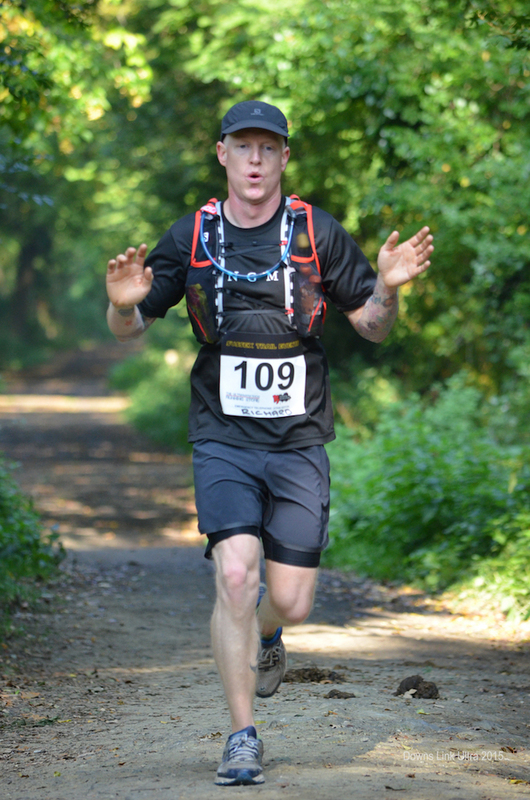 The Downs Link Ultra is one of only a handful of races in which I have achieved this! You can see my full Strava stats here if you are interested. 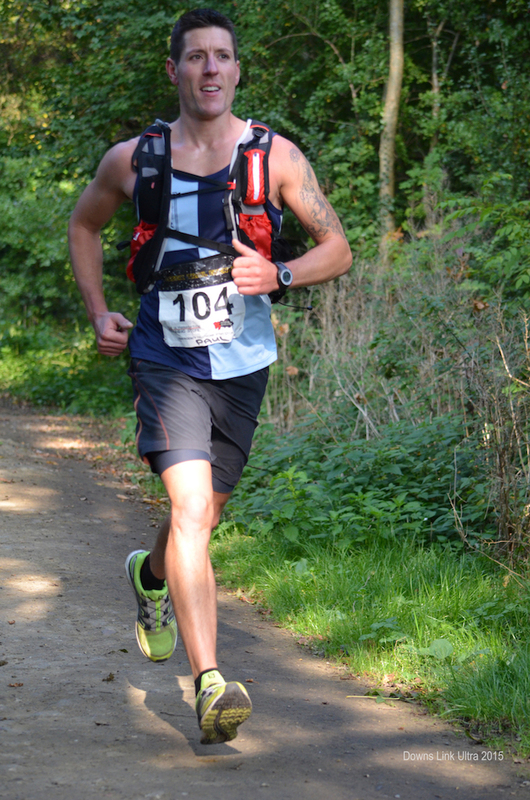 The race was won by a guy from Burgess Hill Runners, called Paul Sargent, in 4 hours 57 minutes. Zoe Norman, who we met at the beginning, finished her longest running in 7 hours 36 minutes. She had been hoping for anything around 8 hours, so she can be well pleased with that. I really wasn’t sure if I would like this race enough to recommend it but I really do recommend it. It’s a runners race. It’s down to earth good old fashioned long distance running. The organisation is great, aid stations are wonderful and it is an all round friendly event. If you are new to ultra running or you are thinking of stepping up from marathon distance, this is one to consider. However, this race does demand that you run it. With a hilly trail ultra, you do have enforced walk breaks which can help a new ultra runner with pacing through the day. This race demands more discipline. You need to be confident of your pacing and sensible enough to take your walk breaks as planned, not just when you’re completely done in. If you have enjoyed this Downs Link Ultra race report and video, please share it with your friends and give it a Facebook ‘like’ or a Google +1. See you at the next event! !